Handwashing dishes used to be a chore but now it is one of my favorite things. Read on to find out why! To be more specific it was leaking underneath the unit into our basement. Super fun. Except not really. It took us about a week to figure out where the water was coming from, then we promptly called the dishwasher repairman to come and service our dishwasher. We assumed it would be a quick and easy fix, not to mention budget friendly. OK not really… but that’s what I heard anyways. 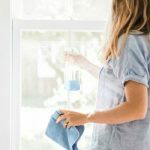 I call my husband nervously because I know he doesn’t need this stress during the day. I give the phone to the repairman so he can explain exactly what the problem is. Ultimately we decide it will be cheaper to buy a new dishwasher then to repair this one. But buying a new dishwasher isn’t cheap and while we do have savings saved up for these sort of emergencies, we just fixed our broken refrigerator the day before. Sounds economical, right? Appliances hitting the tank in numbers. I’m praying we aren’t following the rule of three’s here!!! 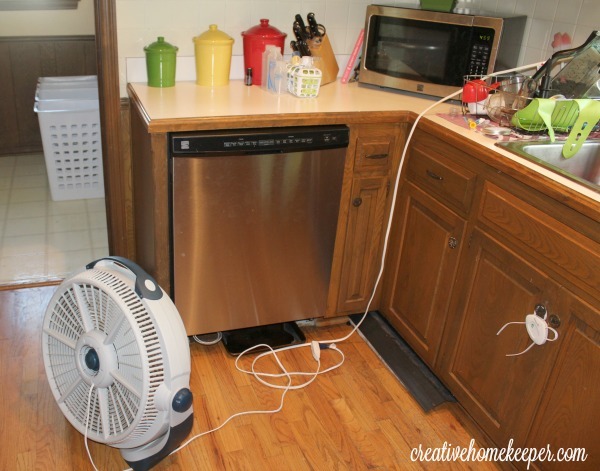 Technically we have a dishwasher we can still use, as long as we have a drip pan underneath and a fan running to dry the wet floor. Sounds totally convenient, right? Except when the baby is constantly trying to stick his little squishy fingers in the fan openings. What could go wrong with this setup? So here we are handwashing dishes for a period of time to save up a few extra bucks to purchase the new dishwasher and, most importantly, to keep my son’s adorable fingers in tact. Honestly it isn’t as bad as I thought. Washing dishes by hand this past week has given me a completly new perspective on some things. 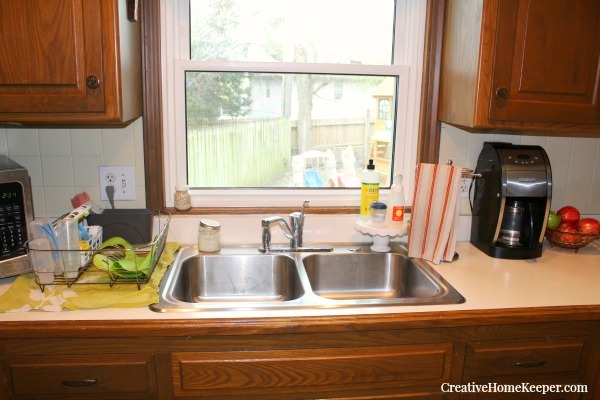 When you rely on the dishwasher to clean your dishes, you don’t necessarily think about all the dishes you are using. You are just pulling one new thing out of the cabinet, using it quickly and then placing it in the dishwasher. I always wondered why we were running out of butter knives before breakfast but it turns out I was using one to butter toast, another to add jelly to toast, another to cut up the baby’s banana, another to cut into my pancake…. see where I’m going with this? We would mindlessly use dishes and utensils and then instead of just giving them a quick wash and rinse, we just loaded them up in the dishwasher. When you have 5 people living in a house, you run the dishwasher once, if not twice a day, using this method. 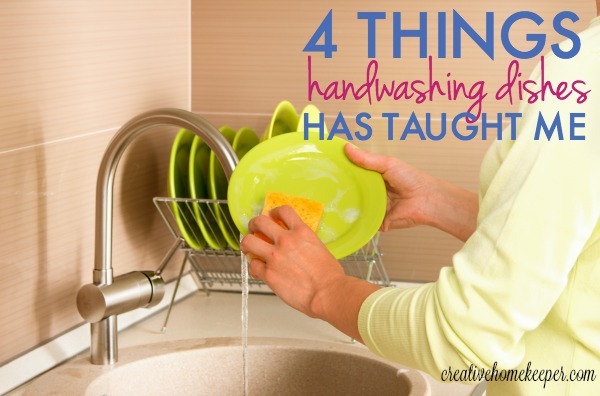 Handwashing actually simplified my life because we were using less. Those knives now are getting a quick rinse in between each use. My kids were using the same plates for breakfast, lunch and dinner. 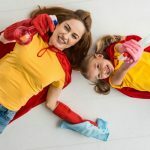 We use one cup or sippy cup a day and now there is no more running around frantically trying to find a clean pot to cook dinner in because all the dishes are clean! Unloading this dishwasher is my least favorite chore for some reason. For the past week that chore has been eliminated and find myself happier. 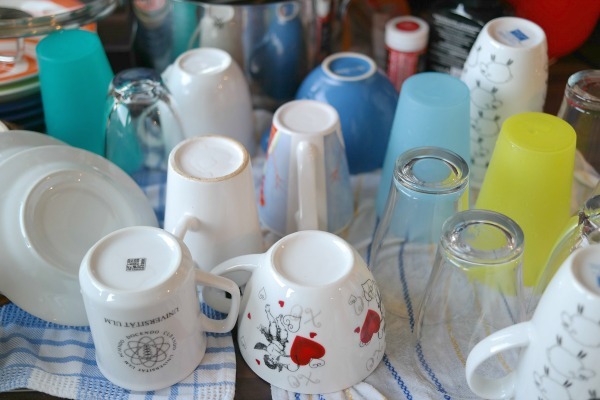 There is nothing worse than waking up and having to unload and put aways all dishes before you can even make breakfast… although I guess it’s slightly better than waking up to a sink full of dishes! Loading and unloading takes a lot of time and effort, and just to be fair, so does handwashing. However there is something a little more more motivating about hand washing, it gives me an instant sense of production because I do it and I’m done. Here me out on this one! Yes, handwashing dishes is still a chore but standing over a sink with warm sudsy water, looking out into my backyard has a very calming effect on me. I’m very thankful for the beautiful picture window we have that looks straight out into the backyard. I can watch the kids playing, I can see the birds, rabbits and squirrels gathering food, or I can look at the beautiful daffodils blooming in the backyard. There are so many beautiful things in nature to look at! Breakfast, lunch and dinner can be kind of an event with 3 little ones. 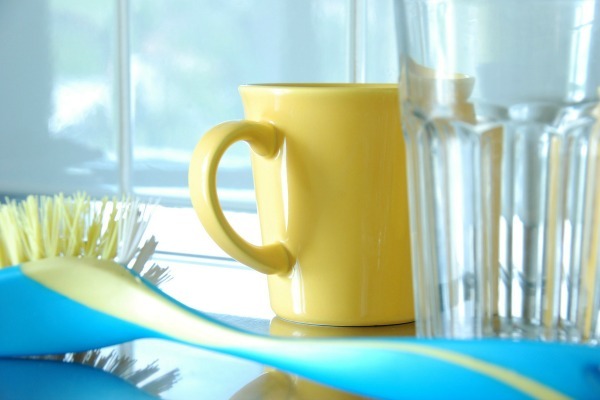 Scrubbing away at the dishes helps absorb some of that stress and, let’s call it what it is…. agitation after a meal. These few minutes after those crazy mealtimes help calm me down and remove some pent up frustration. It’s also the perfect time to grow my faith which leads me to the next point…. I use laundry folding time to memorize Scripture and I also pray over my home as I’m cleaning each room, but standing at the kitchen sink praying instead of letting my thoughts wander unchecked is perfect. I pray for my own stinky bad mom attitude. I pray for the family at church I just received a prayer email from my Pastor. I pray for my husband while he is at work. I pray to see Jesus more in my day and to see His hands guiding me. Those five minutes at the end of every meal praying and focusing my heart and my mind on All the Good Things Above is completely transformative. It helps transition me to the next events of the day, it helps remove my bad attitude and be a more joyful and loving mom. But most importantly, it centers my faith to see God’s calling on my life now in this season. 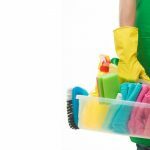 Now you are ready to roll up your sleeves and start scrubbing but before you do that, you do want to set your sink area up so you have all the needed supplies near by. As you can see from my sink area, I have a small bowl I use to hold the sink drain and small scrubber then I use a small cake stand (Target Dollar Spot find… I got mine for $3 but I have noticed they are now $5) to keep my hand and dish soap as well as larger walnut scrubber sponge (think Brillo pads only reusable and environmentally friendly!). I also keep a drying rack off to the side because our sink is weirdly shaped so one doesn’t fit inside. Want to hear something that might sound crazy? I’m pretty sure I will continue handwashing dishes (at least after breakfast and lunch) even after we get our new dishwasher. It will remind me to embrace my philosophy of trying to live as minimally as possible and will give me a chance to breathe and scrub out any Mommy attitude during the day, not to mention reminding me to pray! 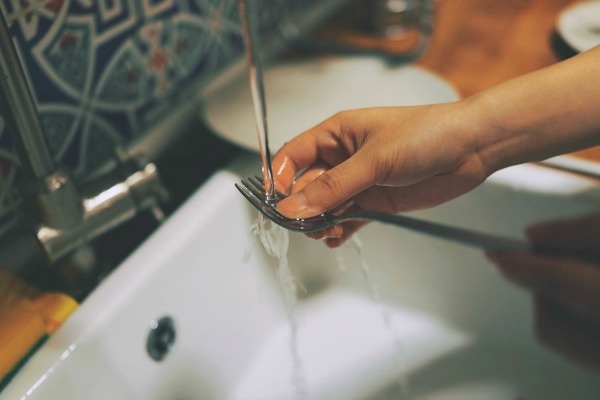 Do you like to handwash your dishes? What lessons have you learned? I actually love hand washing the dishes. Even when the dishwasher is loaded but not everything fits I’ll do the dishes by hand. It calms me and I love the feeling of a clean kitchen after a meal. And when I have the water ready I swipe the counters as well. I like a nice clean kitchen. 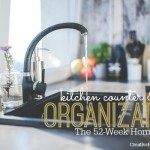 I prefer hand washing and, since it is just my husband and I – and I’m minimalisty, I keep our kitchen stuff to a minimum and push myself to think of doing the dishes as part of the meal making process. I prep, I cook, I eat, I wash… usually I try to wash as I go as well. Clever blog post! 😀 Yes, we use way too many dishes too! 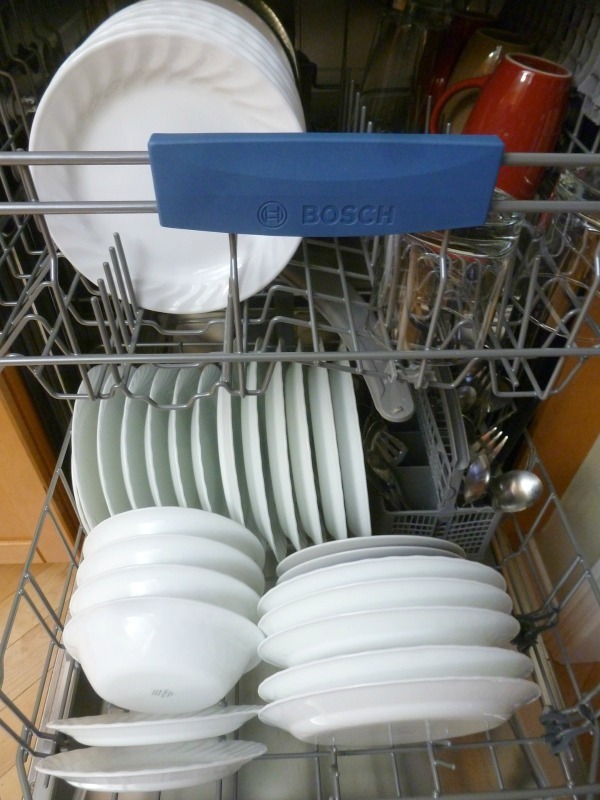 Sometimes I don’t even bother loading our dishwasher – seems like I can wash by hand much faster! Love love love this!!!! My favorite part was praying while you washed!! And watching your gifts while they played!! I will change my tune while I wash!! I love washing dishes (most of the time). We have a dishwasher but it is rarely used. There are only three of us in the house, myself, my OH and our son. If we used it I would be running it every couple of days, which would result in using a lot of dishes and possibly having to wash pots and pans in between. What a waste. Like you I look out into the garden and enjoying watching the birds or even the bats flying around. I also pray and thank God for various things. Having a nice window to look out helps take the focus off of the “work” part so it makes it more enjoyable! We totally use too many dishes! Great time to pray! Loved this. It’s so easy for the dishes to pile up! I prefer to just hand wash as I go. It makes for less dishes to do at once. When my kiddos were younger, we’d sing “Rejoice in the Lord” while we did dishes. A treasured memory, for sure. Going back to handwashing dishes is definitely not fun, but I do understand how it can be relaxing once you accept that it has to be done. In the past, I’ve put on peaceful music and cleared my mind a bit while getting dishes done, and it’s been nice. Thanks for sharing!